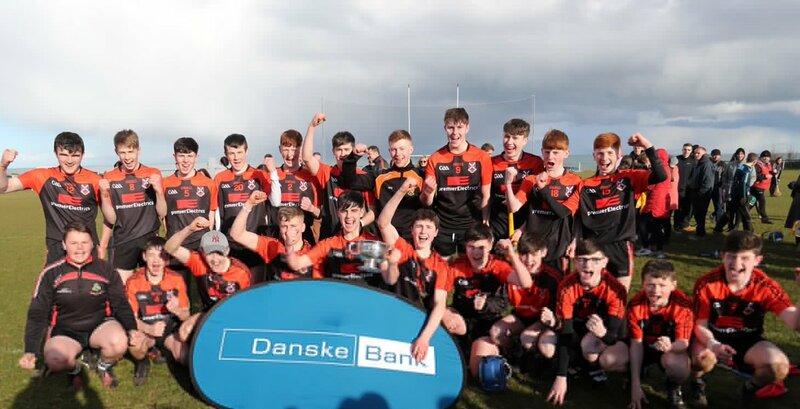 CAPTAIN Enda óg McGarry and forwards Rian McMullan and Michael O’Boyle already held two winning medals for the Danske Bank Foresters’ Cup competition and yesterday in sunny Ballymena they were highly instrumental in completing a famous 3-in-a-row for Cross and Passion Ballycastle. McMullan opened the scoring from a free and hit the first goal as the holders built up an interval lead of 2-11 to 0-2. In total he found the target for seven points in the opening half and O’Boyle added another three. After half-time, St Killian’s raised their game, but McGarry was a tower of strength in defence for the winners and time and again he claimed and used possession very well into the breeze. Team manager Alec Campbell highlighted the contribution of the trio at the end. “We came out of the blocks very strong and we felt that if we brought a serious work-rate to the game, we could lay down a marker from the start. And it helps when you have both the experience and the accuracy of the two boys up front; they can make that hard work further out the field really count. The opening goal in the 13th minute was also something the manager focussed on. Michael O’Boyle’s long range free looked to be tailing wide, but Caolan O’Connor got his stick to it and volleyed across the area for Rian McMullan to pick his spot. That score cemented the early point-taking from McMullan and Ballycastle moved into a 1-5 to 0-1 lead. Ciaran Magill fired over a free for the Tower as an immediate reply, but the pressure from the Ballycastle half-back line was forcing his team into a rear-guard fight and there were only so many attacks Liam McLaughlin and Aidan Scullion could withstand before a second goal arrived in the 19th minute. Central defence was sucked out to the right wing and when the sliotar was played through to Christy McGarry, he drew the last defender and off-loaded for Conor O’Mullan to lift the net. And they were able to push on with four more scores before the break, two each from McMullan and O’Boyle including a brilliant free from the latter from inside his own half. St Killain’s raised their efforts on the re-start, but probably went for goals too early. Padraig McKillop got them off the mark and then Daire Mort placed sub Shea McDonnell for a 39th minute goal and there was a glimmer of hope with McKillop quickly adding a point to make it 2-12 to 1-4. But that was their last score as Enda óg and the rest of the defence reasserted their authority and O’Boyle (two frees), sub Damian Quinn (two from play) and Oisin Elliott tagged on an extra five points to leave CPC comfortable winners. Cross and Passion : K McAuley, J McGowan, E óg McGarry, R McClean, C McGlynn (0-1), P McGilligan D Devlin, C McKinley, O Elliott (0-1), C McGarry, E Laverty, M O’Boyle (0-4, 0-3 frees), C O’Mullan (1-0), C O’Connor, R McMullan (1-8, 0-5 frees),. St Killian’s : C McKeegan, J McAllister, L McLoughlin, O Gillan, M Emerson, A Scullion, P McKeegan, C Hynds, G Leech, C Kilgore, P McKillop (0-2), C Magill (0-1 free), F McQuillan (0-1), D Mort, N McGarrell. Subs : A McSparran for O Gillan (24), S McDonnell (1-0) for N McGarrell (32).